Wolfe Pack Guide Service is a family owned and operated business. We have over 60 years of combined guiding experience between my father Dennis Wolfe, my brother Scott and myself Richard, on the Umpqua, Coquille, Elk, and Sixes river systems. My father brought Scott and I up fishing for whatever fish was around and has taught us most of what we know. To know what you truly love to do, being good at what you love, and being able to make a living at what you love is a rare opportunity. We are very blessed and would be honored to take you on a guided fishing trip. Fishing is more than just catching fish, although you will do plenty of that. Because of our love and knowledge of the wilderness and the fisheries you will not only enjoy fantastic fishing, but also an outdoor river experience that will leave you with a new appreciation for the creation we live in. We fish several rivers on the southern Oregon coast outside of Roseburg west of the I-5 corridor. We have a unique opportunity to fish the rivers that are fishing the best at the time you book your trip with us. Depending on the river that we fish, there are fishing lodges, vacation rentals, and hotels available. We can help make all your lodging accommodations for you. 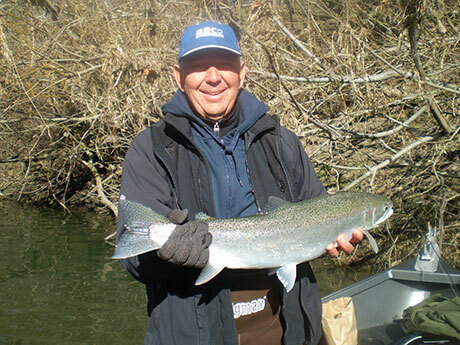 January thru mid-April begins the Steelhead season. We fish the Coquille, Elk, Sixes, and the Umpqua systems for these steelies. April thru October we start fishing the Umpqua system for Spring Chinook, Shad, and the famous Smallmouth Bass. Fall Chinook and Coho are also available in late September and October on the Umpqua. November and December we end our year on the Elk and Sixes rivers for the bright chrome, just in from the ocean, latest fall run of Chinook on the Oregon coast. We are all licensed and fully insured guides specializing in quality guided fishing trips with quality fishing gear.